Teaching Blog Round Up: Rolling in the Dough!! This is my Play Dough Station table. There is enough room for 2-3 students to work comfortably. I'm lucky to have a classroom that is half carpet and half tile. Of course, the Play Dough table is located on the tiled floor. I try to make sure everything the kids "knead" is right at their fingertips! I have a large Sterilite tub with a wide variety of color choices. I love that the tub is clear, so I can quickly check to be sure the lids are all snapped in place and put away neatly. I haven't tried making my own Play-Dough yet. But, I've been pinning recipes to try when my current supply runs out or dries up. My kinders are expected to master 50 sight words. 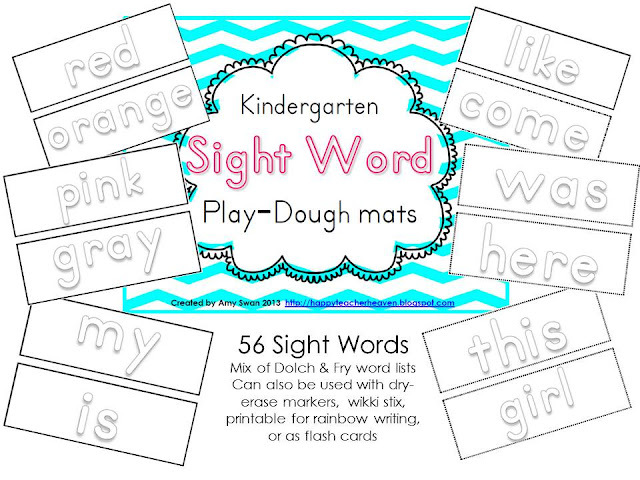 Our sight word list is a blend of Dolch and Fry words. The sight word cards are grouped and designated by varied border designs (solid, dashed, and dotted). This allows me to differentiate the work kids do at this station based on their level of mastery. I separated each group of sight words into a different color bin so students can easily find the words they need to work on and can get started right away! Gotta maximize those instructional minutes! If you'd like a set of these cards for your own classroom, click the picture below to check them out on TPT...they are even ON SALE for you!! :) What I love about these cards is that they don't require color printing. This is good for me because my school has pretty strict limits for color printing. I try to only print in color when it's absolutely essential. These fun box journals are dearly loved by my kids!! I beg nicely ask my friends, family, and students' families to save up their boxes and send them to me at school. I use the cereal size box for a writing journal and cracker size boxes for word study journals. I store them in the blue plastic basket so they are easily accessible. Each student was able to pick out his/her own journal. Because the boxes are (mostly) all different, it's very easy for Kinders to locate their own journal quickly and without frustration. At the beginning of the year, this is a great way to practice reading environmental print! Inside the front cover of the box, I place a red, blue, or red colored dot sticker (like the kind you use at a garage sale.) The sticker provides a private way to help the student remember which set of words to practice. When a student has mastered all the words for the quarter, I draw a happy face inside the dot and place the next color on their journal. When the kids are practicing sight words at the Play Dough Station, they select a card from the assigned colored tub. Students read the word to their station partner, form the word with play dough, trace it with their finger and spell it out loud. Then, they write the word in their journal and move on to the next card. Partners are working independently, but stop to coach one another on reading the words. At the end of the center, each student reads his/her journal page to their partner before cleaning up and moving to the next station or classroom activity. I change-up the play-dough station every 3 weeks to include letters, sight words, word families, CVC words, etc. I have some of the Lakeshore Lowercase Alphabet Dough Stampers and my kids love to use them! 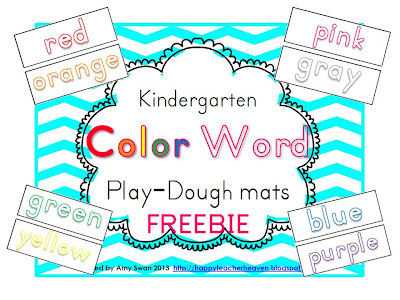 I created a set of colorful Color Word Play Dough cards. Click the picture below to download them for FREE from my TPT store! If you download them, I hope you'll consider returning the favor by following my TPT store and leaving feedback. I'm excited to hear about how your Play Dough station works!! LOVE! Thank you for the freebie! I'm off to buy some Play Dough!